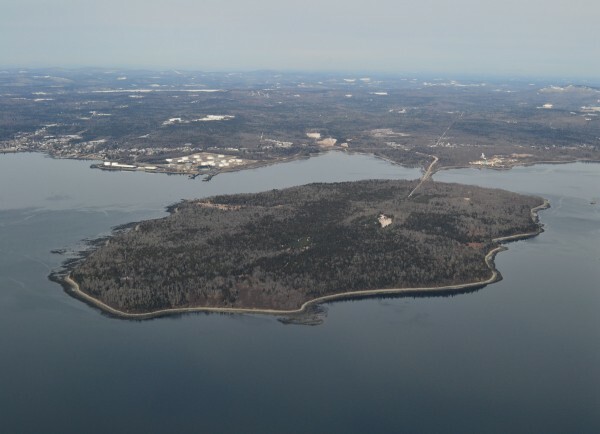 Aerial view Sears Island and Mack Point in Searsport, Maine. Photographed Feb. 27, 2012. BANGOR, Maine — City councilors have formally pledged Bangor’s support for a plan to conduct a dredging project in Searsport harbor that aims to improve access for today’s bigger ships. A resolve to that end was adopted in an 8-1 vote during Monday night’s council meeting, with Chairman Ben Sprague and councilors Joe Baldacci, Pauline Civiello, Nelson Durgin, James Gallant, Gibran Graham, David Nealley and Josh Plourde in favor and Councilor Patricia Blanchette opposed. Gallant said he had expressed his concern about the resolve during previous meetings but decided to support it after receiving information about the level of bulk and liquid tonnage handled in Penobscot Bay from Bob Ziegelaar, president of MainXPO Inc., a company that helps its clients develop business opportunities outside their traditional markets. “And I wanted to know because these numbers are pretty staggering, actually, and with the [dredging], I’m sure the numbers would go even higher,” he said. Gallant said that the yearly totals for bulk freight were 150,782 tons and 1,487,760 tons for liquid bulk. In addition, 2.161 million barrels of petroleum come out of Searsport, he said. Baldacci also supported the measure. “I think it is important for us to add our voice to this issue because Searsport is not just a Searsport issue,” he said. “This is a regional economic issue. It’s going to affect the economies of cities and towns throughout Maine in terms of the movement of goods and services. “I think, as the resolve points out, this is something that needs to be done and that the periodic dredging is routine maintenance for nearly all harbors. I think that the resolve points out several important things but I think the reason we’re adding our voice is because of the fact that it will have a regional economic impact throughout eastern and northern Maine and it’s important that this port be accessible for all kinds of goods and services,” he said. If approved, the $12 million two-part project would dig up nearly a million cubic yards of sediment in order to both maintain and greatly expand the federal navigation channel and turning basin in the harbor that leads to Mack Point, the state’s second-busiest industrial port. Army Corps of Engineers officials say that cargo ships have been getting bigger worldwide, and a lot of the harbors in New England are scrambling to accommodate their deeper drafts. At Mack Point in Searsport, many cargo ships must either arrange to come in at high tide or unload portions of the goods they carry elsewhere to lighten their loads. The project seeks to increase the depth of the channel from 35 to 40 feet, widen the entrance channel from 500 feet to 650 feet and create a maneuvering area in Long Cove near the State Pier at Mack Point. Searsport last underwent dredging in 1964.